Song is a persistent string of hurried, twittering, varied 2 or 3 note phrases. 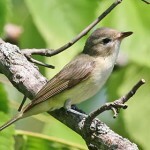 Description: Greenish-olive above; white below, with yellow flanks; yellowish wing bars. Male’s glossy black cap sharply contrasts with white spectacles. 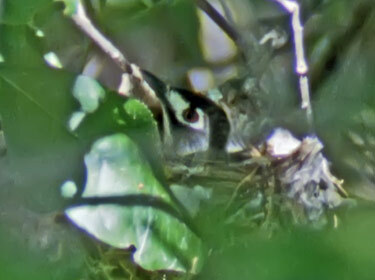 Female has slate gray head and narrower white spectacles. Immatures are browner above and buffy below. Behavior: An active feeder, even hangs upside down to search for insects. 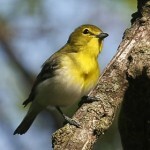 Habitat: Stays hidden in oak scrub and thickets. Where in Nebraska: Accidental. Two early records: a sight record for Sarpy County in 1894, and a specimen from Sarpy County in 1921. 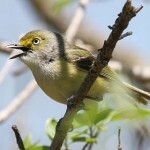 Fun Facts: The Black-capped Vireo is the only vireo with different plummage for males and females.